The Falcon 9’s first stage dropped out of the night sky a few minutes later over the Atlantic Ocean, descending to a pinpoint landing on SpaceX’s drone ship “Of Course I Still Love” parked a few hundred miles east of Cape Canaveral. 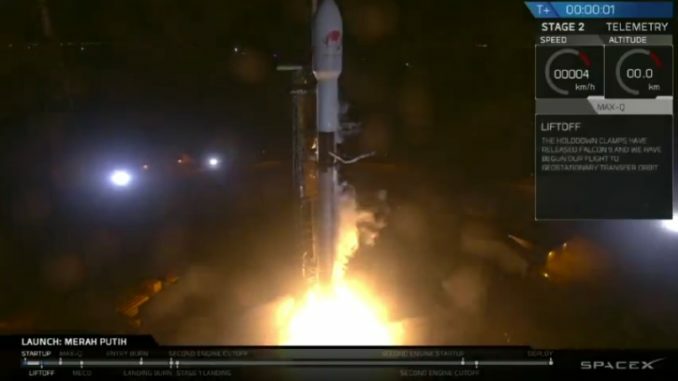 The up-and-down journey was the second such trip for the same Falcon 9 booster, which debuted May 11 with the successful launch of Bangladesh’s first communications satellite. The first stage was also the first of SpaceX’s upgraded line of “Falcon 9 Block 5” rockets, featuring improvements to make the vehicles more reliable and easier to reuse. Tuesday’s mission with the Merah Putih communications satellite, owned by Telkom Indonesia, was the first time SpaceX has re-flown a Block 5 booster. The 229-foot-tall (70-meter) rocket took off from Cape Canaveral’s Complex 40 launch pad at 1:18 a.m. EDT (0518 GMT), turned toward the east and broke the sound barrier within about one minute. Riding 1.7 million pounds of thrust from nine Merlin main engines, the Falcon 9 rocket soared into the stratosphere, then its first stage detached around two-and-a-half minutes after liftoff. The first stage pulsed cold gas nitrogen thrusters to ready for its descent, while the Falcon 9’s second stage — powered by a single Merlin engine — ignited for the first of two burns to send the Merah Putih satellite into an egg-shaped geostationary transfer orbit. 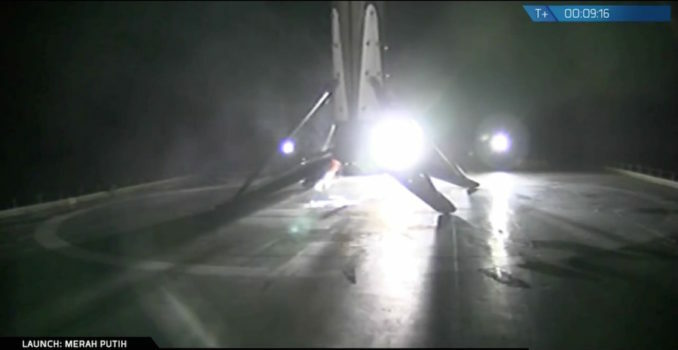 With the aid of grid fins, rocket thrust and four landing legs, the first stage touched down on SpaceX’s landing barge around eight minutes into the mission. “All stations, this is recovery, Falcon 9 has landed,” radioed a member of SpaceX’s launch and landing team. Around the same time, the Falcon 9’s upper stage shut down and entered a preliminary orbit before a nearly 20-minute coast across the Atlantic. The Merlin upper stage engine reignited for a nearly minute-long firing at 1:44 a.m. EDT (0544 GMT), giving the Merah Putih satellite enough velocity to climb into a geostationary transfer orbit with a low point a few hundred miles above Earth, and a high point expected to reach tens of thousands of miles in altitude. Pre-programmed commands gently nudged the satellite away from the rocket at the mission’s 32-minute mark, and live views from the Falcon 9 rocket showed the Merah Putih spacecraft separating from the Falcon 9’s second stage over Africa. Tuesday’s launch was the third SpaceX mission in 16 days, and the company’s 15th launch of the year overall. It was also the 28th time SpaceX has recovered one of its first stage boosters intact, and the 15th re-flight of a Falcon first stage. 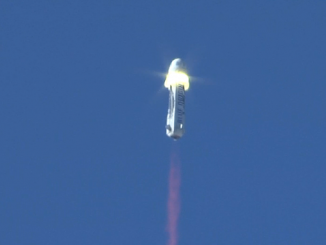 But it was the first time SpaceX demonstrated reuse of a Block 5-generation booster, which the company plans to be its workhorse in the coming years, until a new, super-powerful rocket dubbed the BFR is ready for service. SpaceX was expected to conduct more invasive and time-consuming inspections on the first returned Block 5 booster, and three months after its first launch, the stage was ready to go again. He said the Block 5’s first stage booster is designed to fly 10 times “with no scheduled refurbishment.” With “moderate scheduled maintenance,” Block 5 first stages could be capable of 100 missions, Musk said. Such reuse goals are crucial to SpaceX’s long-term mission of reducing the cost of space transportation, with an aim to eventually launch a Falcon 9 rocket, recover the booster, and re-launch it within 24 hours, according to Musk, who said in May that could be accomplished as soon as next year. Between 30 and 50 boosters for Falcon 9 Block 5 vehicles could be manufactured to meet customer demand, each flying multiple times, he said. The turnaround between the Bangabandhu 1 and Merah Putih missions did not set a record for the shortest time between flights of the same Falcon 9 first stage. That distinction goes to an older-generation Block 4 booster, which launched April 18 and then again June 29 from Cape Canaveral, before SpaceX intentionally disposed of the rocket. 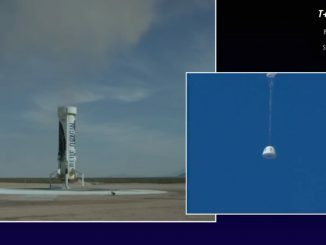 Block 4-generation Falcon 9 boosters could only be reused once. 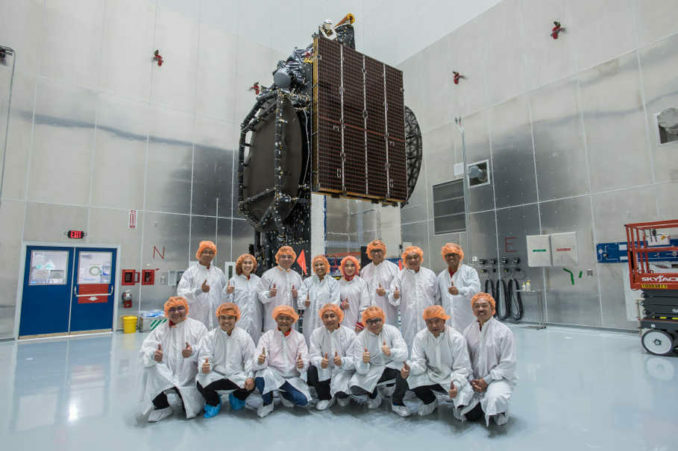 The Merah Putih satellite launched Tuesday will provide C-band telecommunications services over Indonesia and India. The new telecom craft was built by SSL in Palo Alto, California. SSL completed construction of the Merah Putih satellite ahead of schedule, according to Telkom Indonesia, also known as PT Telkom. The new satellite will replace Telkom 1, which failed in a mysterious debris-shedding event in geostationary orbit last year. Officials from Telkom Indonesia expected the Telkom 1 satellite, which launched in 1999, to remain operational until Merah Putih’s launch. But Telkom 1’s failure last year forced the operator to re-route communications traffic through other satellites. The Merah Putih satellite is designed for a 16-year life, its owner said in a statement. The spacecraft will be positioned in geostationary orbit more than 22,000 miles (nearly 36,000 kilometers) over the equator at 108 degrees east longitude. Merah Putih’s on-board engine will circularize its orbit over the equator in the coming weeks. Based on SSL’s 1300-series satellite platform, Merah Putih carries 60 C-band transponders with coverage across the Indonesian archipelago, and other parts of South and Southeast Asia. The satellite will provide Internet, telephone and cellular backhaul services, according to SSL. 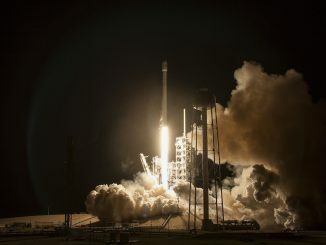 Tuesday’s flight came 16 days after an early morning Falcon 9 launch July 22 that sent the Telstar 19 VANTAGE communications satellite into orbit for Telesat. Another predawn Falcon 9 flight from Vandenberg Air Force Base in California on July 25 delivered 10 Iridium voice and data relay payloads to orbit. The next launch from Cape Canaveral is scheduled for Saturday at 3:33 a.m. EDT (0733 GMT), when a United Launch Alliance Delta 4-Heavy rocket is set to loft NASA’s Parker Solar Probe on a seven-year mission to fly through the sun’s corona. A flight readiness review Monday approved the continuation of final launch preps for Parker Solar Probe, which will fly closer to the sun than any previous mission. SpaceX’s next mission is set for launch no earlier than Aug. 23 with the Telstar 18 VANTAGE communications satellite to provide broadcast, enterprise and government communications services over parts of India, China, Mongolia, Southeast Asia, and the Pacific Ocean region. If launch remains set for Aug. 23, liftoff is scheduled for a window opening at 11:33 p.m. EDT (0333 GMT on Aug. 24).